I am grateful for the scarlet runner beans that keep pumping out the sweet green beans for the free farm stand, what a loyal friend! The previous Sunday I went to the graduation party for the students who took the permaculture class and went to see the projects that everyone has been working on. It turned out I spent a lot of time talking to and meeting new people and I didn’t get to see much of the projects. I did get to see the design for the project of adding trees and food plants to the park where the Free Farm Stand is located and it is really exciting to see a dream that has been in my mind for a long time going slowly forward. While there Kat who helped teach the class invited me to come up to Marin on Friday to take the class on the Soil Food Web and making compost tea. She said I could get in free and that perhaps I could get a ride with Diana who might be going up. So it all worked out and Diana and I drove up on Friday. I got a chance to meet the sweetest man around name Caleb Summers who runs a business called Soil and Life (http://www.soilandlife.com/). His knowledge of gardening and soil is extensive and I was really impressed by how much he knew. I was a bit familiar already with brewing compost tea and the idea of the Soil Food Web, but his talk made things so much more understandable for me. His excitement and passion about what he calls “bio-agriculture” was contagious and I left the workshop wanting to go home and making my own brewer. I now look at the garden with eyes focused not only on the plants, but on the critters (he calls it biology) that live in the soil and help make our plants grow healthy. It was also nice to meet Diana who it turns out lived in a couple of communes in the seventies and was familiar with the newspaper I help put out with my fellow communards called Kaliflower. She shared with me some wonderful stories involving people we both knew. I always question myself when I think about giving up a day of gardening to do something else. I love to be in the garden more than anything and it sets me back a day when I do that. I decided to go to the Community Day at the Victory Garden across from city hall anyway. There was a Sustainable Resource Fair there and I thought I would get the word out about the Free Farm Stand. The garden had grown a lot since I had last seen it and it is totally worth the visit downtown to just see it grow. I finally got to meet John Bella (with the Victory Garden project) who helped start this garden Actually I didn’t talk to him much, but he told me they had just harvested 100 pounds of produce that I assume went to the San Francisco Food Bank. I actually thought the event was not too exciting and I started feeling like I should have stayed home and gardened rather than sit at my table and give away plants and talk about the farm stand. I didn’t get too many people visiting my table nor that many people curious about the free farm stand (maybe people just don’t what a free farm stand is and aren’t interested enough to ask). Part of the idea of me going down there was to see who I would meet and “network”. I did meet some people that I enjoyed talking to, including an interesting woman who was involved in a local mushroom education program that among other things inoculates gardens with mushrooms (she didn’t have a card but the name of the group was something like Sporios). I also met a woman named Lena who is an “Agrarian Arts Coordinator” of Slow Foods Nation. I was glad to meet her because she has collected songs and dance related to agriculture (I think at their event there will be some dancing going on). I have been wanting to organize an event for children and adults where we sing to our plants in the garden. If anyone wants to help make this happen please contact me. It turns out the best part of me hanging out there was meeting Rebecca who was one of the first people to visit me at my table. She is a gardener in the Tenderloin and was asking me a lot of garden questions. On Monday she was in my neighborhood checking and gardens and called me. I invited over to help us with our honey extraction and she came by and was a lot of fun to work with and get to know. And then on Tuesday she came by to help me in Treat Commons and in the Secret Garden. Another person I am grateful for meeting. I was lucky that I didn’t have to go to church on Sunday morning (it was canceled so church people could fellowship with other church members). I needed the morning to harvest food from the three gardens because I didn’t get any food harvested on Saturday. I picked a lot of lettuce, kale, jalapeño peppers, tomatoes, and plums from the Secret Garden. I picked tomatoes, green beans, baby greens for a salad, chard, kale, and flowers from my backyard. At Treat Commons I picked scarlet runner beans, tomatoes, baby lettuce from my “lettuce lawn” that Ruben inspired me to plant, yellow zucchinis, and flowers. While I was there a man name Josh came by that wanted to interview me about the garden and the Free Farm Stand. He was making a radio documentary about urban farming and had just visited MyFarm, a San Francisco business run by this guy Trevor: He designs and plants organic gardens in people’s backyards and charges a weekly fee to maintain and harvest the vegetables. “MyFarm installation costs $600 to $1,000, and maintenance costs $20 to $35 per week, depending on the garden’s size, and includes weeding, harvesting and composting. Those who opt to have larger gardens installed pay a smaller weekly fee and provide food to customers who, eventually, will be able to order a weekly vegetable delivery collected from MyFarm backyards.” I have heard that their business is booming and they are having a hard time hiring enough people to keep up. I agreed to be interviewed because I wanted to present to radio listeners another possible way of getting people to eat local. I must admit I was somewhat unsure about dealing with the media again, especially after Angie showed me a copy of 7 X7 with an article in it about Alemany Farm. The article and photo of my friend Jason who is the part time manager of the farm really turned me off. I am not sure why, partly because of it seemed superficial and slick (the magazine itself is itself a turn-off in it’s glossy hipness http://www.7x7sf.com/features/cover/25761489.html). I really don’t want to see myself inflated like that since this Free Farm Stand is not about me but the project itself and all the characters that play a part of it. So Josh came over to my house after I finished harvesting to see my backyard garden and watch the whole operation of me loading the food on my bike cart and hauling stuff to the Free Farm Stand in the park garden. While I was starting to get the bike cart, my door bell rang (it could have been a knock I don’t remember) and I opened the door and two of my most favorite and beautiful women gardeners where standing there with their arms laden with baskets of garden produce and flowers. I was truly shot right up to heaven and the wind of gratefulness blew me away. This is one of the things about the Free Farm Stand that just gets me so excited, when out of the blue people demonstrate the best side of human nature, to do something not only beautiful but helpful, with a touch of class to boot. It is sweetness sublime. 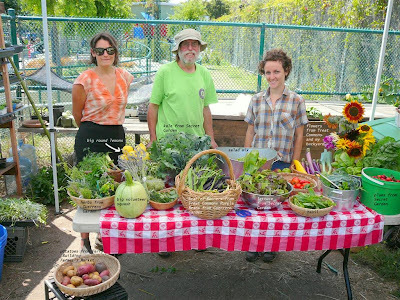 Caitlyn and Brooke who garden in a backyard on Guerrero whom I have written about before, stayed the whole morning and some of the afternoon, helping me set up the farm stand, arranging the table beautifully. I am glad Josh the radio interviewer got a chance to record all this and see how magical the universe can be sometimes. Besides Caitlyn and Brooke showing up, a whole lot of other neighbors and friends came by and made the Free Farm Stand a lot of fun this week. Leslie from City Slicker Farm in West Oaklandbrought surplus cucumbers from People’s Grocery in West Oakland too. I enjoy just seeing her and talking about what is up with her and City Slicker Farm. Josh brought the prettiest yellow and most round and large lemons from his friend Nicole’s backyard in West Oakland (I am thinking it might be a good place to live if you are into farming). The neighbor that has a CSA drop off at her house came by with melons, garlic, and potatoes that were not picked up and they went pretty fast. I ran out of bags towards the end and will really need some next week. I am not sure how to get people to bring their own bags. I think it is harder to get plastic bags these days in San Francisco which is an interesting problem for groups like us that depend on used bags to give food away. On Monday some friends showed up to help us extract honey and it went smoothly. On Saturday I put the bee escape on the hive which is a one way door that allows the bees that are in the top boxes of the hive where the honey is to leave but not come back in. Since our last honey extraction at the end of May (about 2 ½ months ago) we have had two medium supers or boxes on top of the brood boxes (each box filled with honey approximately 2 gals or 24 lbs.). Three or four weeks ago I looked in the boxes and saw that they were full so I added an empty box on top to give the bees more room. On Saturday I discovered they had filled that box with honey too so there must have been a big honey flow. We wound up harvesting about 6 gallons of honey. I just don’t understand all the beekeepers in the bee club we are in that have more than one hive (some have five or six). Not only is it a lot of work to extract the honey, but what do they do with it all? Like I have said in a previous post, I have been a vegan for over twenty years so maybe I have a different perspective on beekeeping. I am not interested in honey production as much as just loving to live with bees in my backyard. It seems animals and gardens go together. I would like to live with more animals like with chickens or ducks, but I don’t feel comfortable killing them when they get old. When I give away honey I want to remind people that honey is a special gift to be respectful of. Bees can teach us to be humble and to respect all living creatures. We can learn to curb our tendency to get greedy when we taste something so sweet and delicious.